For those of you who are fashion conscientious and are not content with the look of the standard iPhone or Droid, then Christian Dior has the phone for you! The New Dior Phone Touch is the first smartphone from the French designer, coming out three years after Dior’s first cellphone endeavor, and it does not disappoint. 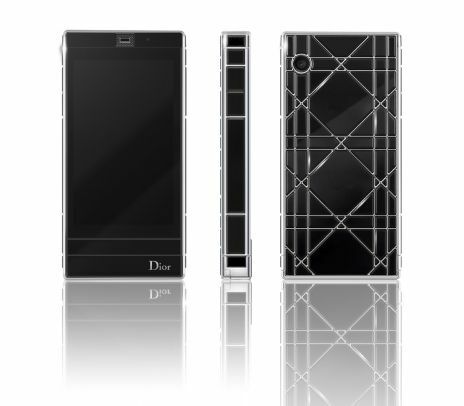 “I wanted to be an architect” said Dior, and that is exactly what he did with this touch phone. The Dior phone is handmade in a French Workshop out of only 99 pieces. It is made with the finest luxury materials such as sapphire crystal, gold, steel, diamonds, and mother-of pearl. The Dior logo is etched into the sapphire crystal to give it a luminous effect. This phone leaves nothing out. It is adorned in Sapphire crystal in Dior’s signature colors-Glamorous Black, Dazzling Red, Pure White, and Shanghai Blue. Also, Dior’s signature oval logo becomes animated each time a number is dialed. Even the Dior phone’s apps are glamorized. Each app has a thin white line surrounding it in order to have it look like the street nameplates in Paris. Apps such as the camera, video, gallery, and animations have icons that immortalize moments in Monsieur Dior’s life. This is not only a phone but a true work of art. Every little detail on the Dior phone symbolizes something. Every ringtone and touch tone has been created by an audio designer exclusively for this phone. The phone is the perfect size for a woman’s hand. It comes with GPS, google maps, real time, Facebook, Twitter, an MP3 player, and a Video Recorder. It is both fashionable and useful. What more could you ask for when it comes to a cell phone? You can buy the Dior Touch Phone at http://www.colette.fr/#/eshop/article/30778069/dior-telephone-mobile/524/, however it is currently sold out. For the first time ever, H&M, a Swedish retail company known for its inexpensive and fashion forward clothing will be available exclusively online through Elle.com starting today. Fashionistas on a budget will be able to order H&M products online for a limited time by going onto Elle.com/hm. In early January 2012, H&M will launch a full e-commerce site in the U.S. for Internet shoppers. The H&M site coming in January will also include an exclusive plus-sized collection. Whether or not shoppers will use the online H&M store is up for discussion. In a recent article Dhani Mau of Elle.com addressed the fact that though H&M is known for its inexpensive accessibility an online site may not be as popular. “H&M’s sizing and quality are both often frustratingly inconsistent, which makes ordering online risky,” Dhani Mau wrote in the article. Also, ordering online will add to the cost of this inexpensive brand with the factors of shipping and handling fees taken into account. With H&M stores in most major cities in the US, shoppers already have easy access to its clothing and accessories. In recent years, H&M has been quickly gaining momentum in the fashion industry. In 2009 and 2010, the branding consultancy Interbrand ranked the company as the twenty-first most-valuable global brand. H&M is also planning to open around 250 new stores in U.S. this year. With online and in-store shopping, H&M is forecasted to have a successful future. Coco Chanel: intelligence operative and couture fashion designer? What would you think if you were told the creator of "the Little Black Dress" led a double life? Is it possible for a brilliant designer to be involved in war crimes? This new books goes beyond the rumors and prevents evidence that the beloved fashion icon was also a Nazi spy. 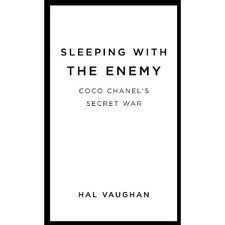 “Sleeping with the Enemy: Coco Chanel’s Secret War,” by Hal Vaughan reveals evidence of how and why Chanel was enlisted in a number of spy missions. The book tells the full story of the mystery years during Chanel’s life from 1841 to 1954. Her affair with Baron Hans Gunther von Dincklage is detailed, suggesting that von Dincklage was a “Nazi master spy.” The book ends explaining Chanel’s flee to Switzerland in alleged exile for nine years, with her return to Paris and rebuilding the iconic brand, which is now the House of Chanel. “Sleeping with the Enemy: Coco Chanel’s Secret War” is on shelves August 16. The Autumn/Winter 2011 Armani Privé collection, unveiled at Paris Haute Couture, makes a statement in both the fashion and philanthropic worlds. Giorgio Armani paid tribute to the recent events that devastated Japan while experimenting with classic elements of Japanese style. Last season the collection was all about metallics, the tailored trouser and floor-length silhouettes. The latest Armani Privé builds on these features but uses lighter touches in both color and texture. Soft, painted silk in shades of cherry blossom pink replace the dark, two-tone sequins and metals. Although the line is still infused with classic Armani black, it is accented with pastel patterns reflecting Japanese art and the country's signature red and white. 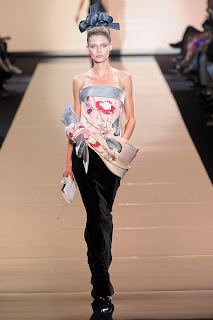 Other features of the collection include kimono-tailored jackets, a slim waistline accentuated by obi belts, pleats and Phillip Treacy headpieces built from origami and flowers which allude to the beauty of traditional geishas. The collection, Hommage au Japon, is what the designer called a "creative gesture" to further support his label's recent and ongoing contributions to a UNESCO scholarship, supporting a three-year program for child victims of the catastrophic events that shook the country last March. Armani, who said he was "profoundly moved by the tragic events," has made a beautiful and inspirational impact; since the show more and more designers and celebrities from Sandra Bullock to Lady Gaga have stepped out to show their support for the cause. Both the collection and the atmosphere of the show itself carried the themes of structure, minimalism and elegance, making Armani and traditional Japanese fashion a perfect match. The lovely Emma Stone and Olivia Wilde will soon be gracing ads, magazines, billboards, and commercials all over the world with their gorgeous faces and fresh personalities. And, if I am allowed to be frank, I don't think anyone will complain. These two beauties have been chosen by the American cosmetics line Revlon to be their global beauty ambassadors. They will also be appearing in the up and coming Revlon campaign which will begin running in early 2012. The duo's first campaign is said to be for a new nail enamel line and color cosmetics line. "I have been familiar with Revlon for as long as I can remember," said Stone in a statement. "I vividly recall my mom wearing Revlon makeup and I remember getting to the age when I was finally able to wear Revlon myself." For Wilde, she's excited to be part of doing some good for women. Not only will the two flaunt their beauty, but they will also participate in Revlon's fundraising efforts that gear towards helping women's health issues. "I have always admired Revlon and their commitment to giving women the confidence and tools they need to feel beautiful, both inside and out," said Wilde. "Creatively, Revlon has never been afraid to push the envelope, which is important to me. I also love that they use their tremendous recognizability around the world to do good as one of the industry's biggest champions of women's health. It's exciting to join a company with a big heart and big ideas!" Stone and Wilde could not be the more perfect pick for Revlon. I am patiently awaiting this new campaign as it will definitely be something to admire.